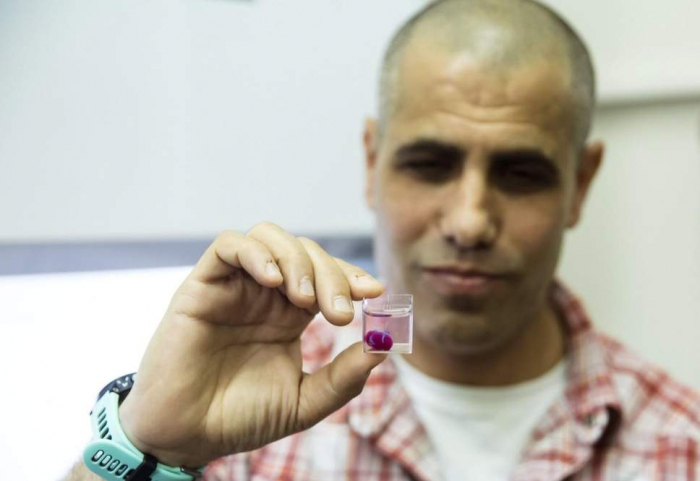 Scientists in Israel have produced the world’s first 3D printed heart using human tissue, they say. Researchers at Tel Aviv University say the miniature organ was made with a patient's cells and came complete with blood vessels, ventricles and chambers. They now believe that a full-sized human heart could one day be produced using the same technology – saving the lives of hundreds of people who die each year awaiting transplants. His team now hope to stimulate the printed heart into functioning like a real one. The cells are currently able to contract, but not yet have the all-important ability to pump. Once this is done, the organ will be transplanted into an animal in a move to further understand the way both the body and heart reacts to such operations. Speaking at a news conference on Monday, Professor Dvir added: “People have managed to 3D print the structure of a heart in the past, but not with cells or with blood vessels. This heart is made from human cells and patient-specific biological materials. “In our process, these materials serve as the bioinks, substances made of sugars and proteins that can be used for 3D printing of complex tissue models.